Far away from noisy Moscow there is an empty field near a small village with strange figures built here long ago. Crowds of people come here to observe and touch the strange figures, huge wooden constructions and high columns. What was it built for? This mysterious place has been famous for 10 years already. Each summer a weekend festival takes place in the small village of Nikola-Lenivets, a four-hour drive from Moscow. Of course, it is no mystery how these art objects appeared. 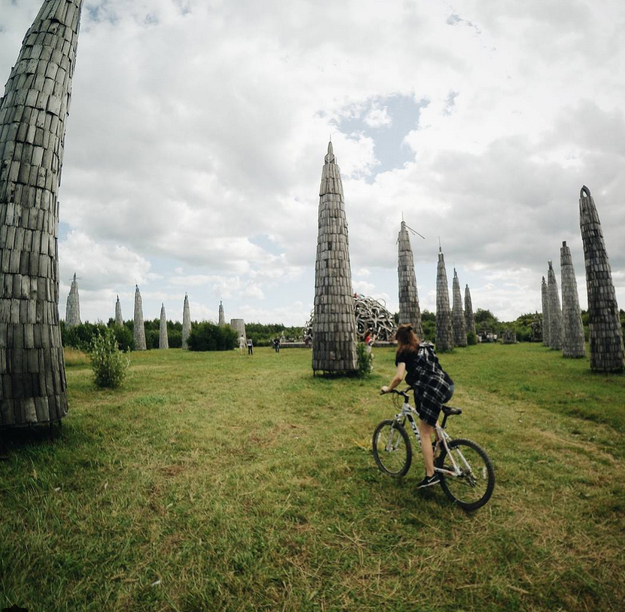 Since 2000 the village of Nikola-Lenivets has been an outpost of modern art, thanks to the work of Nikolay Polissky. Together with local residents from nearby villages, he created a set of objects around the village. It were armies of snowmen, towers made of hay, fire wood, rods. To look on the objects art experts, journalists and spectators have started to arrive. Polissky organized several art events, when he understood that it is time to take things more seriously. And in 2005 he made a decision to found the festival, called “Archstoyanie”. The name of the festival translates as "Archaic Standing," in reference to the historic event that took place here more than five centuries ago: the Great Standing on the Ugra River. This was a bloodless standoff between the Khan of the Golden Horde, Akhmat, and Grand Duke Ivan III of Russia. The two leaders were on opposite sides of the Ugra River, a tributary of the Oka River, along which ran the border of the Duchy of Moscow. In autumn 1480, this standoff marked the final fall of the Tatars’ Golden Horde yoke. This year, on the last weekend of July, the festival was held in the villages of Nikola-Lenivets and nearby Zvizhi. ... come across art objects everywhere..
... take a dangerous selfie on top of art installations. … sail through beautiful Russian scenery of birches and silent nature. At the same time, Muscovites bring their own forms of traditional entertainment – night concerts, lectures, village markets, DJs and singers. It’s a chance for everyone to find something to suit their taste and the time for a small forgotten Russian village to enjoy its moment of fame.